were born in Chamberlain, in 1945 and 1947, respectively. The family continued to live in South Dakota until 1961, when they moved to California. Although members of the family returned to South Dakota at various times and for varying periods after that, for the most part they lived in other states. Claude died in 1984 in Colorado, and Phyllis in 2007 in Texas. 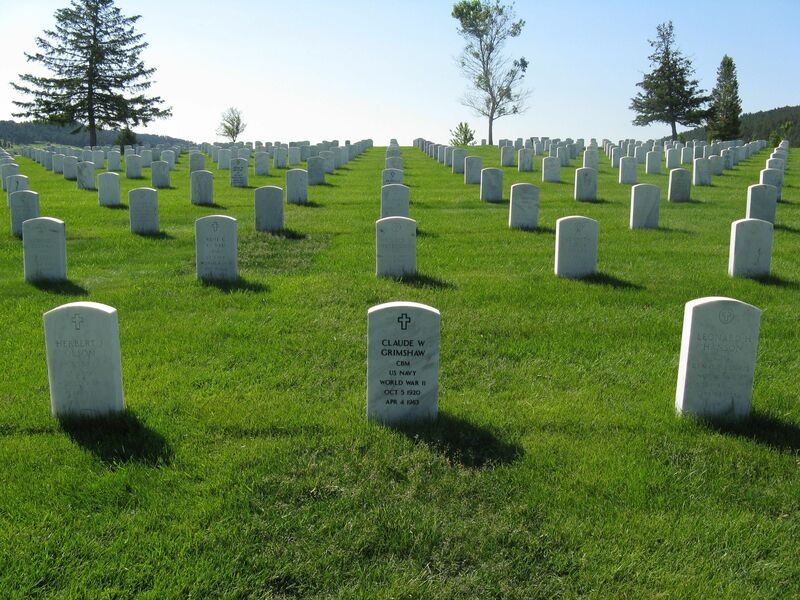 They are buried together at the Black Hills National Cemetery near Sturgis, South Dakota. The families of Claude’s parents, Walter Claude and Freda (Sehnert) Grimshaw, immigrated to South Dakota, from Wisconsin and Germany, respectively. The family of Phyllis’ father, Jay Rogers, also came from Wisconsin (by way of Iowa, where Jay was born) to South Dakota. The origins of the family of Phyllis’ mother, Bessie Cummings, are not known; she died when Phyllis was only five years old. Claude’s father died several months before he was born (in fact Claude almost “didn’t make it into the world”), and Freda Grimshaw remarried, to Joseph Bice. 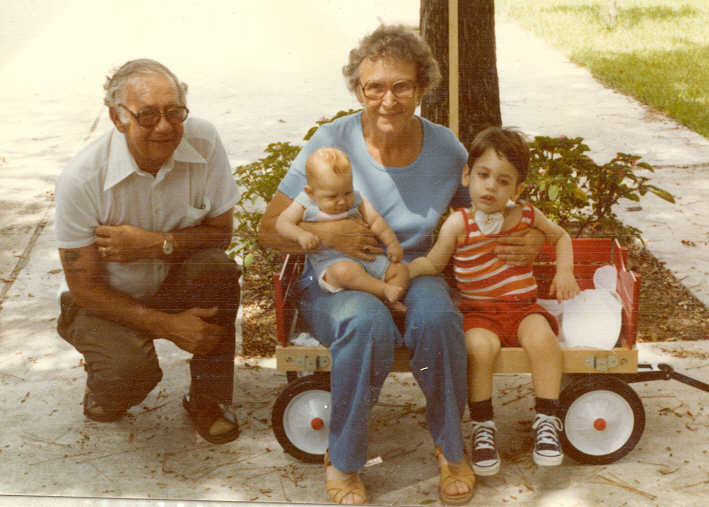 Claude and his older brother, George Grimshaw, were raised by Freda and Joe Bice, who had another child, Stanley Bice. The family remained in the area around Oacoma and lived near the Missouri River. Joe and Freda lived out their lives there (Joe remarried after Freda’s death, but is buried with her at the nearby Chamberlain cemetery). Claude’s natural father, Walter Claude, is buried near his parents (George and Aris Grimshaw) in Presho, South Dakota, where he and Freda met. 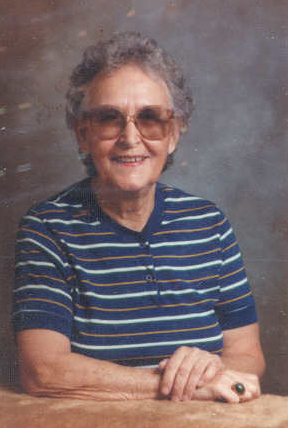 Phyllis was born in Platte, South Dakota, and the family lived west of that town in a “draw” (called “Rogers” draw, on Snake Creek) next to the Missouri River. Phyllis’ mother, as noted, died when Phyllis was just five years old, and her father, Jay Rogers, did not remarry. The large family of eight (seven girls and one boy) more or less raised each other with Jay’s participation when his work as an itinerant farm hand permitted. Jay operated a ferry across the Missouri for a number of years and was always “close” the river. The family moved briefly (less than a year) to Oregon and then returned to South Dakota, where Jay lived out his life. He is buried near Bijou Hills in Brule County with his wife, Bessie. The Grimshaw family had a highly varied and very interesting life in South Dakota and thereafter in other states. 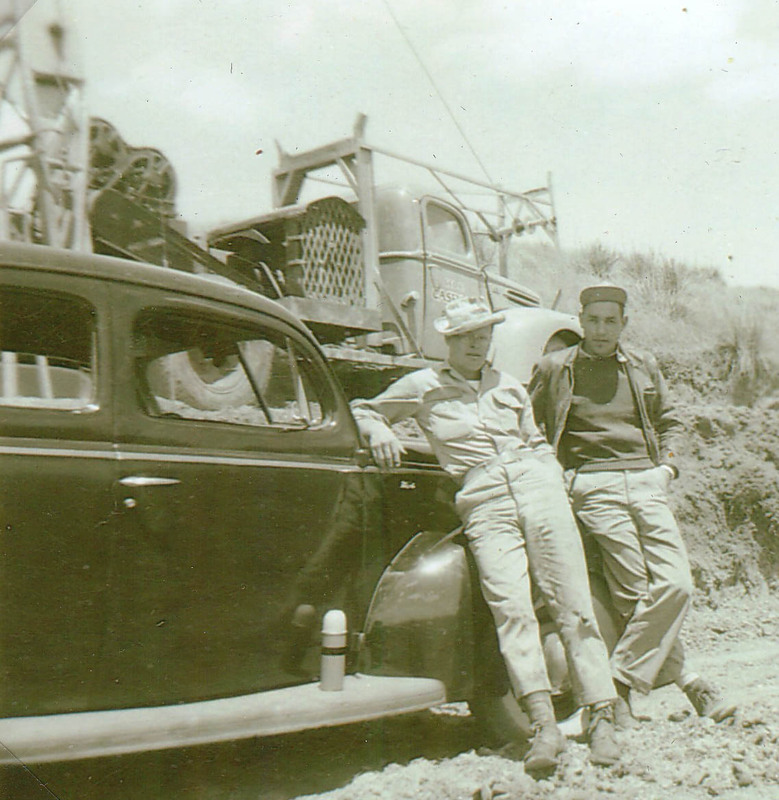 Claude started in earth trenching in South Dakota after his return from the war, and from there expanded his career into many areas of earth excavation and resource use. 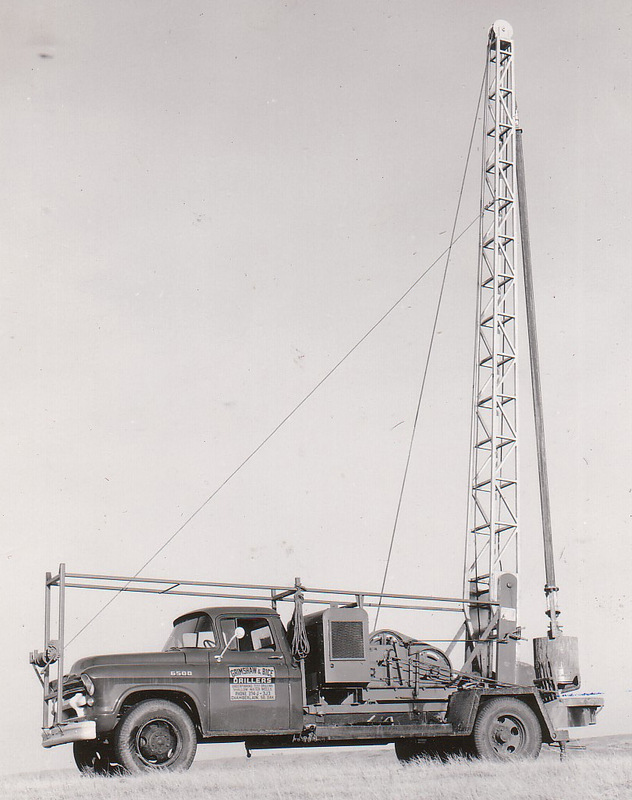 He owned the largest water well drilling concern in the state (part of the time in partnership with his half brother, Stanley Bice) for a number of years in the 1950s before departing for California in 1961. He went there to accept a job with a firm that manufactured drill rigs, and from that beginning travelled worldwide (including Australia, Africa, the Middle East and the North Sea) for a number of companies in a career that included vertical boring (water wells and building foundations), tunneling (for example, for metro train lines), and sea floor foundations for offshore oil and gas drilling platforms. Phyllis sometimes accompanied him on these travels and the couple lived for a period in Australia. 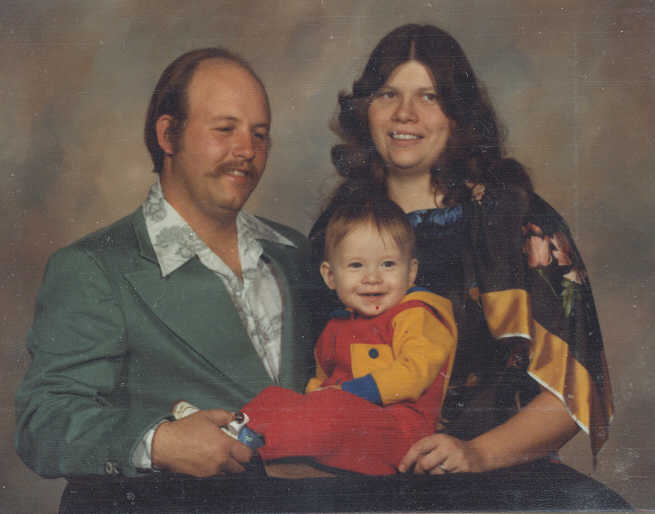 Claude and Phyllis retired to Colorado and, after a brief stint of water well drilling in South Dakota with his younger son, Joe, returned to Colorado, where Claude passed away from kidney failure in 1984. 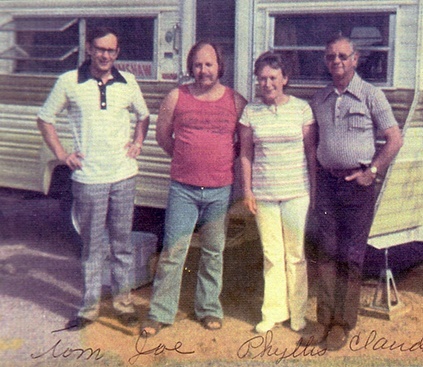 After Claude’s death, Phyllis went to Austin, Texas in 1984 to be near her older son, Tom. She was very involved in raising her granddaughter, Anna Grimshaw (now Corley), and remained close to her other three grandchildren (Joe’s children, Jacob, Sarah, and Robert) in Maryland throughout the remainder of her life. Phyllis did not remarry and lived out her life in Austin. She died in 2007 a few years after brain surgery for a non-malignant tumor took away her independent living capability. As noted, she and Claude had chosen to be buried near Sturgis in the Black Hills National Cemetery. 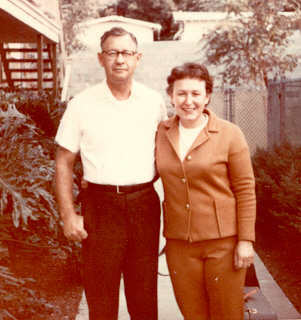 Claude and Phyllis Grimshaw, at apartment in California (Whittier?) in about 1967. Photo from Doris Matucha album on “Grimshaws”. Claude Walter Grimshaw., about 1961 in California. Photo from Freda Bice album. Phyllis Grimshaw, date unknown. From Doris Matucha album. Norfolk, Virginia, in August, Claude was dispatched to the Aleutian Islands with the 21st US Naval Construction Battalion. The unit arrived at Dutch Harbor in October 1942 and remained in the Aleutians until November 26, 1943, when it was deployed to Camp Parks near San Francisco. Claude departed the Aleutians two or three days prior to the 26th and was on the Liberty Ship John P. Gaines when it broke up at sea on November 24. Most of the passengers, including Claude, were rescued. He was assigned to the 89th NCB while at Camp Parks. The next record of Claude was his marriage to Phyllis Rogers in San Jose, California on April 1, 1944, about four months after leaving the Aleutians. Phyllis traveled from Oacoma for the marriage. The 89th Construction Battalion, a replacement pool at Camp Parks, was demobilized on July 15, 1944, and Claude was apparently transferred to the Construction Battalion Replacement Depot (CBRD)  his third assignment at that time. Claude was then assigned to the 17th Naval Construction Battalion, which departed for Saipan in September 1944, about two months after the main battle on the island had taken place in July. 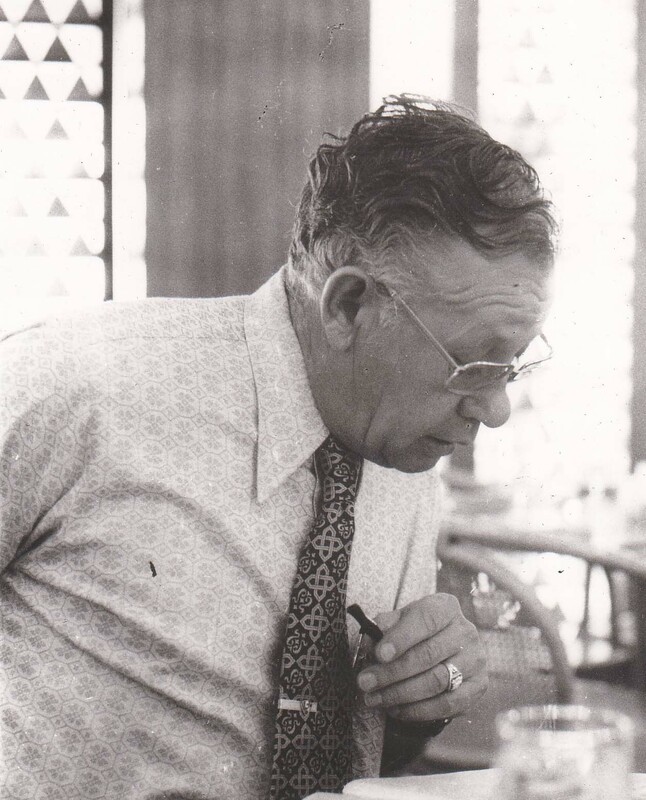 He apparently remained on Saipan until early 1945, because his half-brother Stanley Bice, who was assigned to a US Army Air Force maintenance unit on Tinian, visited Claude on Saipan in 1945. Sometime after meeting with Stanley, Claude departed with his Seabee unit for Okinawa, where the main action took place from April to mid-May 1945. Claude reported to his family that he was injured in action while attempting to rescue a US Marine who had fallen from a rope ladder while transferring to a troop landing ship. It has not yet been confirmed, but it is likely that Claude was injured while piloting an LST a common assignment for a CBM in the Seabees  during or after the 2½-month long battle on Okinawa.Claude was released from active duty in Minneapolis in November 1945 and joined his new family (his first son was born during the preceding March) in his hometown of Oacoma, South Dakota. After attempting farming for a while, Claude became involved in the earth trenching then in the earth boring and water well drilling business, which he continued throughout his professional life. According to Claudes separation record, he served in five units — a training battalion in Norfolk followed by the 21st and 89th Battalions, the Construction Battalion Replacement Depot (CBRD) at Camp Parks, California, and finally the 17th Battalion. A brief history of these units has been found in the internet and is shown below. Formed at Norfolk, the 21st Battalion reached Hueneme Sept. 22, 1942, and embarked for Alaska Oct. 10. The Battalion operated from Dutch Harbor for 14 months, with detachments on Atka, Adak and Ogilaga. The 21st returned to Camp Parks Dec. 14, 1943. On its second tour of duty, the 21st reported to the Seventh Regiment July 27, 1944, at Pearl Harbor, and operated at Moanalua, Intrepid Point and Waipio Point until the Spring of 1945, when the Battalion moved on to Saipan and the Ryukyus to finish out the war. Formed at Camp Allen in February 1943, the 89th Battalion was transferred to Camp Peary later that month. On April 21 it was moved to Camp Parks. After serving more than a year as a replacement pool, the 89th was decommissioned at Camp Parks July 15, 1944. The 17th Battalion was commissioned at Camp Allen Aug. 8, 1942, and transferred to Camp Bradford the next day. On Sept. 1 the outfit was moved to Gulf-port, Miss, and three weeks later to Davisville, R. I. Embarking at Staten Island on Oct. 1, the Battalion arrived at Argentia, Newfoundland, on Oct. 12. On March 14, 1943, the ranks were swelled by the addition of CBD 1004, filling the Battalion complement. Returning home, the unit sailed from Argentia on Nov. 17, 1943, arriving at Davisville Nov. 20. On May 9, 1944, the outfit entrained for Port Hueneme, arriving May 14. After a month at Hueneme, and three months at nearby Point Mugu, the Battalion started its second overseas tour, sailing from Port Hueneme Sept. 11. 1944. Saipan was reached Oct. 6, 1944. After the Okinawa invasion the outfit was transferred there. Camp Parks was a Constructions Battalion Replacement Depot (CBRD): the rest camp and training facility for Seabee units that had returned from the Pacific. Thanks go to Fay Bice, Stanley’s wife and Claude’s sister-in law, for providing information and photos for this booklet. Thanks also to Sam Bice, Fays son, for making accessible materials in Joe Bice’s trunk of family heirlooms, which included several letters from Claude. Much of the information and photos presented here is from photo albums and scrapbooks prepared by Claude and Phyllis. The most important one for Claudes World War II experience is a combined album and scrapbook described in Section 11 of this booklet. Much of the information on the training and Alaska deployment of the 21st NCB is from a Souvenir Annual. 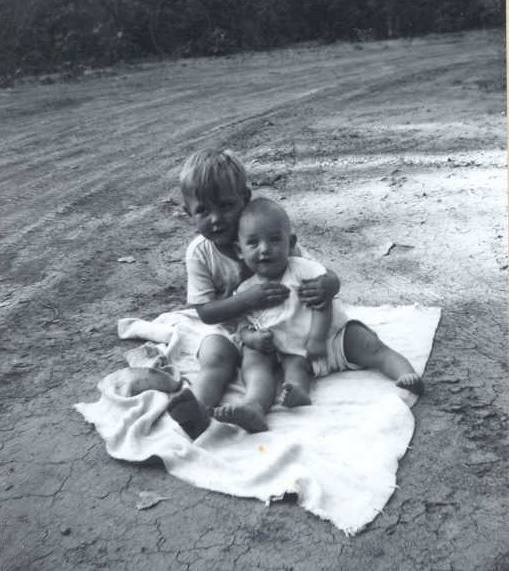 Tommy and Joey on blanket on Missouri River bottom, about 1948. Photo from Doris Matucha album. 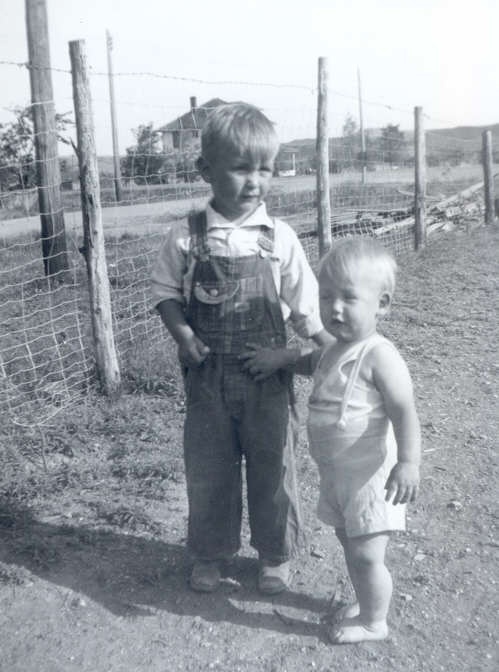 Tommy and Joey near fence, location unknown, about 1950. Photo from Doris Matucha album. 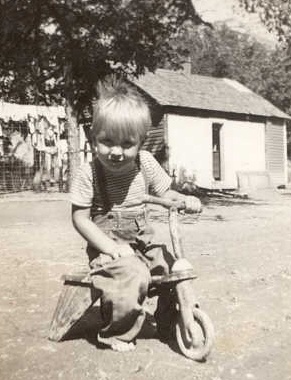 Tommy on challenging tricycle, location unknown, about 1948. Photo from Doris Matucha album. Joe and Robbie with Jacob. Portrait about 1979. Photo from Doris Matucha album. Claude and Phyllis with grandchildren Anna and Stephen Grimshaw. Photo taken at TIRR, Houston, 1979. Photo from Doris Matucha album. Was Claude Severely Injured in the War? Photo of Earth Boring Machine at Manganese Test Site near Oacoma, SD. Stan Bice is the man on the right. The other gentleman is Mr. Young. 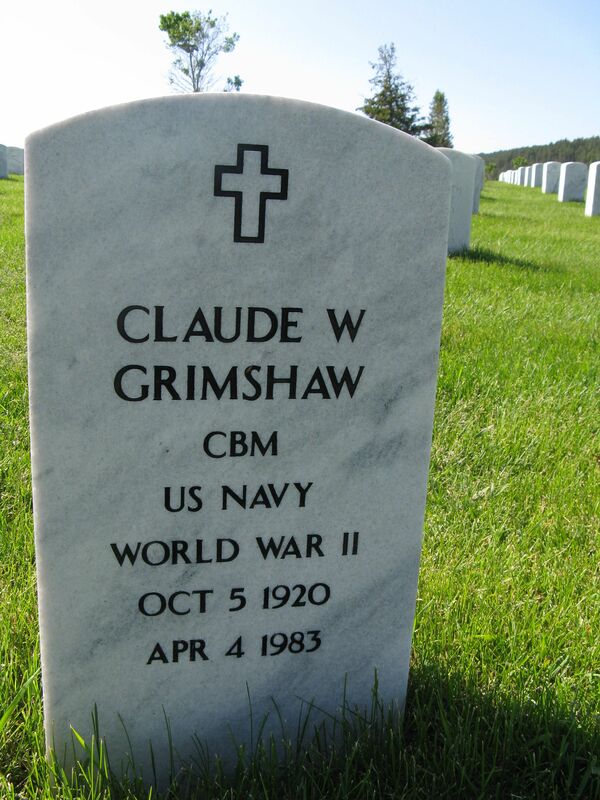 Claude was buried at Black Hills National Cemetery near Sturgism, South Dakota when he died in 1983. 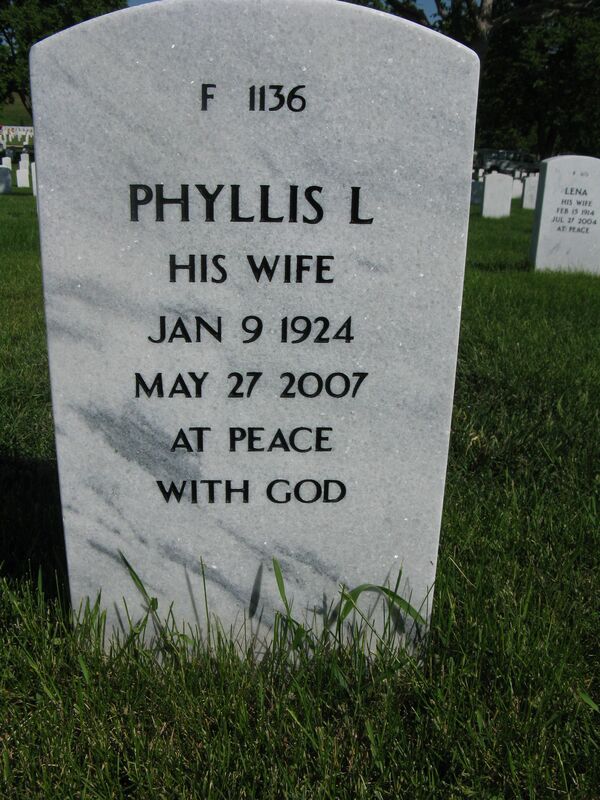 Phyllis was interred with him after her death in 2007. Photos of their grave are shown below. National Cemetery Entrance. 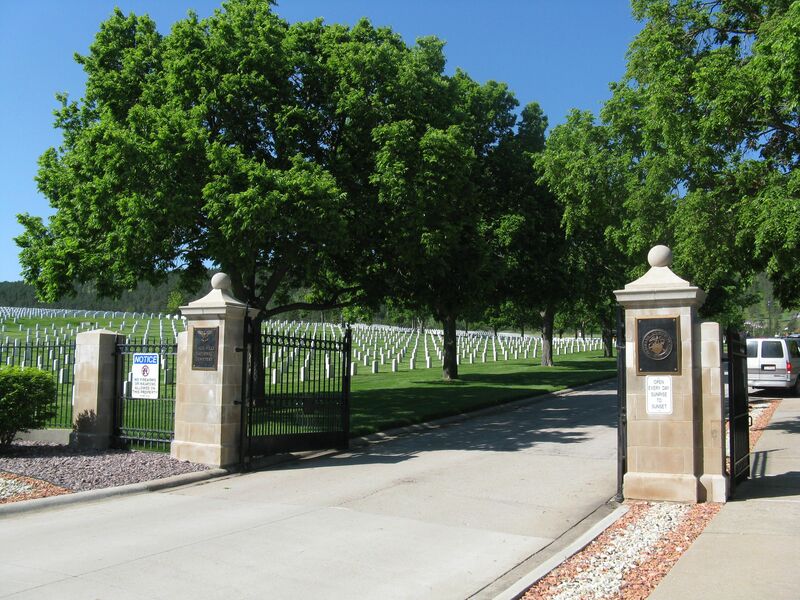 The plaque on the right gatepost reads “Black Hills National Cemetery”. Claude and Phyllis’ grave is in the part of the cemetery on the left side of the photo. View of Claude and Phyllis Grimshaw’s grave marker, followed by closeups of both sides of the marker. The “CBM” on Claude’s marker stands for “Chief Boswain’s Mate”. Webpage posted June 2008. Slightly updated January 2009 with change of banner and addition of photos. Updated May 2013 with more organization and addition of final resting place photos.